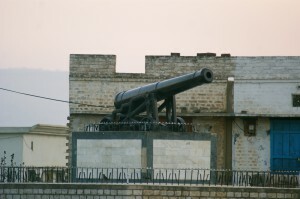 A nineteenth century cannon sits at the entrance of a Pakistani village. Michael Noble takes a look at the story of the Dulmial Gun. Dulmial is a village approximately a hundred miles south of Islamabad in Pakistan. A century ago, the area was part of British India, which meant that its inhabitants were drawn into the Great War on the side of the Allies. A settlement steeped in military history, Dulmial sent 460 of its men to fight in the British Army, the largest single participation of any village in Asia. Nine gave their lives. 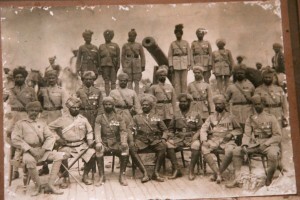 In recognition of this service and sacrifice, in 1925 the British government offered Dulmial an award of their choosing. The man in charge of this choosing was Captain Ghulam Mohammad Malik, the highest ranking and most decorated soldier in the village. The Captain was a man of great experience, having commenced his military life in the Derajat Mountain Battery and participated in Lord Roberts’ march from Kabul to Kandahar in 1880. A career soldier, he eschewed the British offers of land, money and water facilities, choosing instead to have Dulmial’s contribution recognised with the presentation of a cannon. The British agreed to this selection and provided Dulmial with a twelve pounder. Agreeing was the easy part. Getting the thing to Dulmial would be quite a different matter. The gun was to be collected from the First Punjab Regimental Centre in Jhelum, from where it could be carried by train to Chakwal. There, the gun was dismounted and loaded in a cart to be pulled by three pairs of oxen for the remaining 28 kilometres. The roads were semi-mountainous and passage was difficult. It would take the ox carts two weeks to cover the distances. From five kilometres out, at Choa Saiden Shah, the route became more difficult still and Dulmial had to despatch five additional pairs of oxen to relieve the initial six and complete the gun’s journey. Safely in Dulmial, the gun was placed at the main entrance to the village and a photograph taken with the local commissioned officers. It remains there today, a reminder of the contribution that Dulmial made in the First World War. Dulmial is now known within Pakistan as the ‘village with the gun’, but it is rather less well known in the UK. 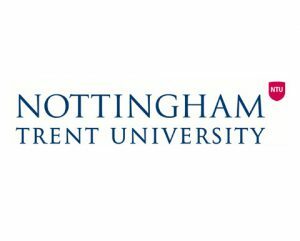 ‘This is because very little has been written or published about the the village in English’, says Dr Irfan Malik, a Nottingham man whose family originates in Dulmial. ‘I have visited Dulmial many times over the years’, he continues ‘and I have made it my aim to research the World War One history of the village as it played such an impressive part during the time’. It is Irfan’s intention to bring this hidden history to a wider audience and help to share the reasons of just what a nineteenth century Scottish cannon is doing in the mountains of Pakistan. ← Where did the headstones for the First World War cemeteries come from? Fantastic history about the famous cannon. We are proud of our ancestors who achieved this gallantry award of GUN, welcoming all the visitors in Dulmial . Dulmial Village is known as ” TOOP WALA GAOUN ” & ” HOME OF GUNNERS ” every where in Pakistan & abroad. The Gun was a motivatinal factor for joining the Armed Forces & Dulmial produces five generals ,23 Brigs & so many cols,Majs, & other class one officers due to the reason that they all played with the gun from the childhood & the stories of the elders who participated in 1WW ,!! WW, & other wars give them courage , devotion , dedication to serve the nation. My Village Dulmial is really a great village . I pray for the glorious future of my village. Congratulations to all who have contributed to raising the profile of Dulmial Village to the international stage. It is a great honour to be associated with the village. May the grand traditions of the village continue for generations to come, and the bravery of yesterday’s soldiers not be forgotten. Enjoyed reading this most informative blog! Well done. 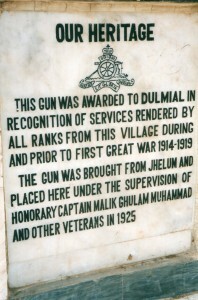 The military achievements of Dulmial village are to be honoured by the British High Commission, Islamabad, Pakistan at a First World War Centenary reception in November 2014. At the same event there will be the unveiling of a plaque in honour of Pakistan’s three Victoria Cross recipients. 1. Khudadad Khan 1914, from Dab village, Chakwal. 2. Mir Dast 1915, from Maidan valley, Tirah. 3. Shahamad Khan 1916, from Rawalpindi. We had another VC as well,Ali Haider from what is now IFF(59th Scinde Rifles and later 4/13 FF) who won it in WW 2. We had another VC from Mian Wali. Please check. Guys, I wrote about the GUN sometime back. If interested, read the blog at http://countryroads.pk/the-guns-of-cossipore-and-the-boys-of-dulmial/. A groundbreaking reference to Dulmial from 1934. This is the prove of Highest participation in the south Asia. i am tassadaq hussan malk local of dulmial.really i dont have word to thank them all, who love their history culture,and dulmial past contribution with british army.so i specially thanked to dr irfan sab,and riaz ahmad malik former head of ferhan model school,who personly take interest to hilight the glory of dulmial as well as our national heritage military gun. LOVE YU ALL HATE FOR NON. Many thanks for your comments & interest. War Speech delivered by His Honour the Lieutenant-Governor of Punjab, Sir Michael O’Dwyer at Jhelum Darbar on the1st November 1917. I was enthralled with all the history and research in this blog. A photo of the Dulmial WW1 commemorative village plaque (honouring the 460 men who went out through the War) was sent me by my brother-in-law, Maj-Gen (retd) Ali Hamid – and this photo featured in my talk to The Pakistan Society in London, 19 August this year. I feel that someone should take up the task of researching and bringing together the stories of all these WW1 plaques dotted around in villages in the Punjab, indeed all Pakistan. Thank you very much for your interest & work. It is much appreciated. 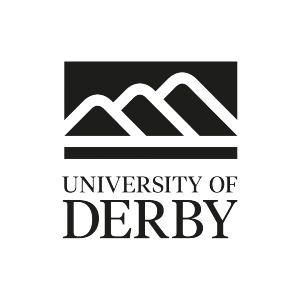 We are trying to raise the profile of the role of the British Indian Army in WW1. There are a lot of Officers in the present Indian Army whose roots are from village Dulmial including self. Very proud of the roots. how come so many people are claiming the award, as it was awarded to one person only?